Yesterday, Sweet Baby and I went about the woods wildcrafting nettles with a few other sweet mama/baby pairs. It was a lovely Sunday afternoon in the PNW. A bit misty, but not rainy, just moist enough to dampen the forest we (carefully) tromped through together, with baby tied to my back, and me in my rain boots. It smelled earthy, and of fern and spring, and the plants were bright and welcoming. Sweet Baby was pleasantly stimulated as she always is outside; taking it all in and babbling happily. I wondered how many times would we find ourselves in the forest together? The thought of it made me smile. 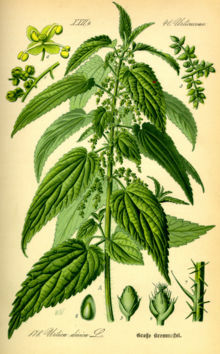 Urtica dioica from Thomé, Flora von Deutschland, Österreich und der Schweiz 1885. Native to Europe, Asia, northern Africa and North America, it is an herbaceous perennial flowering plant. It dies all the way back to the ground in the winter, and is one of the first plants to emerge in Spring. The stinging sensation one gets from contacting the plant comes from trichomes on the leaves and stems. The trichomes are hollow stinging hairs that act as needles that inject histamine and other chemicals into humans and animals. An ideal environment for nettles is moist soil with phosphate and nitrogen. Nettles are the exclusive larval plant food for many species of butterfly and moth. Nettle has long been used as medicine and food, and effectively treats arthritis. 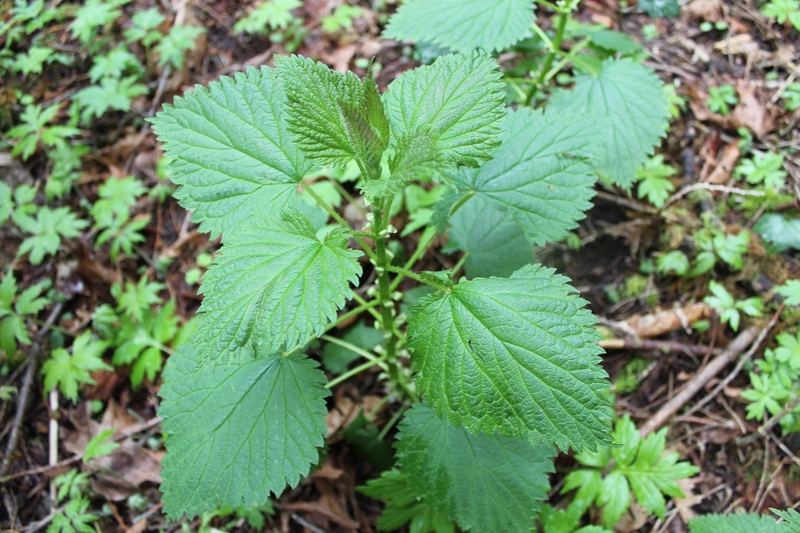 Nettle is believed to be a galactogogue, promoting lactation for nursing mothers. We were armed with a paper bag (with handles for ease of use), garden gloves, kitchen shears, long sleeves and long pants. We were careful about what we collected and followed the tenets of wildcrafting. Sustainability is very important to our family and our actions in the forest are no exception. As I hunched and stooped, I snipped the tops of my specimens and used the tips of my shears like chopsticks to pick up my loot and drop it into the bag. I was being extra cautious because my gloves were thin and I hadn’t been stung in many, many years so I was a bit wary of the outcome. Alas, the inevitable; and it wasn’t that bad. I got stung through my gloves and stung a bit through my jeans when I would unsuspectingly crouch down near a nettle. The stingers weren’t nearly as potent when buffered through my clothing, and yes, Sweet Baby was safely high up on my back enjoying the sting-free ride. (A more careful wildcrafter could have been sting-free, but that’s just not my style). 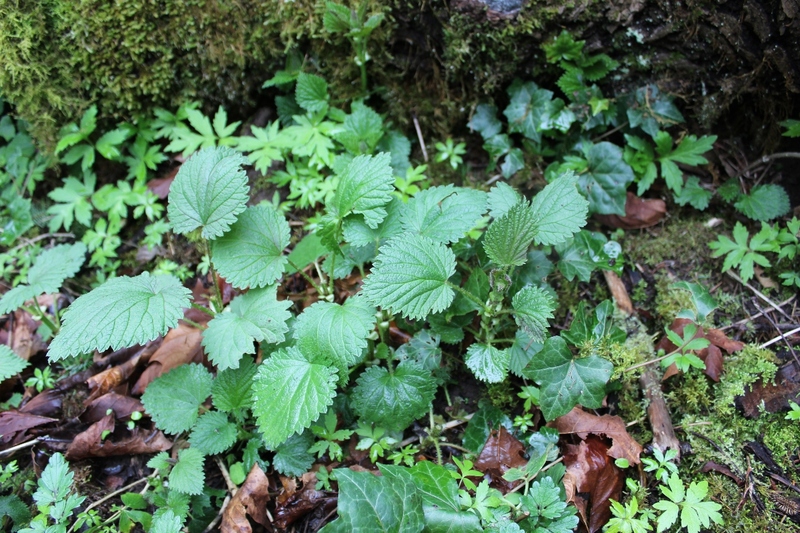 Nettles grow in disturbed areas, and though I scoured many parts of the forest, there was definitely a sweet spot where they liked to grow. A more determined wildcrafter may have had better luck, but I respectfully garnered half a grocery bag and headed home. Dear Husband had prepared a DIY herb drying rack for me in earnest of the coming seasons, so I had a place to dry whatever loot I wasn’t going to play with. 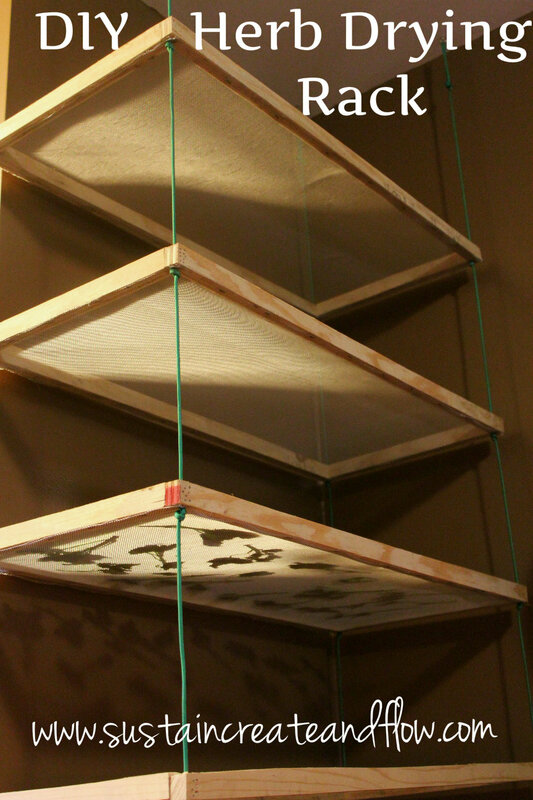 The rest of my loot, which wasn’t much at this point, is set to dry on my shiny new rack. I intend to gather more nettle in the coming days to tincture, infuse, and blanch/freeze for the year. As far as culinary uses, think of nettles as you would any other green like spinach or even basil. Use them in soups, frittatas and omelets, in pesto, on pizza, in lasagne and meatloaf, in casserole and in teas. You get the idea. Stinging nettle is ‘kind of a big deal!’ 🙂 As if the coming of spring wasn’t enough to smile about, the coming of the nettle is another. Early spring, just when the nettle has emerged and before it has flowered is the right time to gather the stinging nettle. Ingesting it after that point may result in an upset tummy. Needless to say, Sweet Baby and I will be busy gathering our food in the next few weeks! 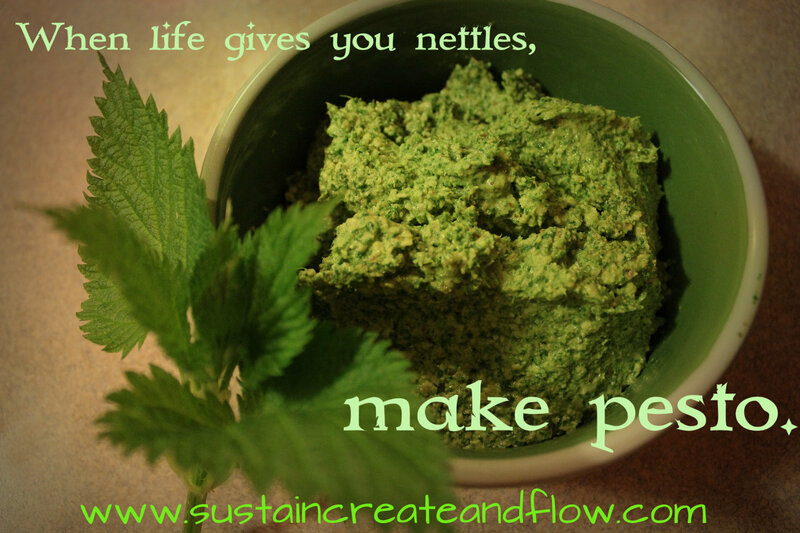 If you want to join in the nettle fun, but are unable, a GREAT source for dried nettle is here. What a great guide! I haven’t done anything with nettles since I was small child and cannot remember a thing, this is a great refresher – thanks! Great information for a great herb. Thanks!! I love this! Thank you so much for this post. I’m hoping we make it back to the PNW. I’m homesick now! We live in an urban area right now, but I will remember this for later. And I’m following you now because you blog is obviously a treasure trove of knowledge! BTW, where do you hail from in the PNW? Nettles are a wonder for men also . Very helpful at reducing prostate swelling. New to your blog, but I have a feeling I’ll be often returning. I’d like to share a use for nettles I haven’t seen in your post: nettle salad. Learned the recipe at traditional market (in Eastern Europe where I currently live) from a hippie wildcrafter and three sweet old ladies. The way you go about it is you use only the youngest, freshest nettle tops (like the top 1-2 inches), lemon juice, water and fresh parsley greens. For about a handful of nettles I usually use, half- to 3/4 of a handful of parsley greens and the juice of 1/2 lemon. Finely chop the parsley, maybe even the nettles,if you like, squeeze the lemonjuice on top, thoroughly mix it up and add enough water to cover the whole shebang completely. Then you cover it and let it sit. Usually you should let it sit for a minimum of 2 hours, but personally I found I get the best results if I leave it for about 10-12 hours. The lemon juice and parsley neutralize the nettles stinginess. When you’re ready to eat the explosion of green yumminess, just strain the lemon water. You can either drink the water separately instead of lemonade, use it for a smoothie or just throw another batch of nettles in it. Since the water is full of lemon juice you can reuse the water for multiple days, usually topping it off with a little bit more lemon and water as you see fit.